While this is a totally optional gesture for your guests staying around the area or within your wedding room block hotel for your wedding weekend, if you were to ask us if we recommend providing these - our answer will always be “YES!”. Welcome bags are a cute and personal way to welcome and thank your guests for traveling near or far to be a part of your wedding day. So now, what do you include in these welcome bags? We’ve got a list for you of our top recommendations to include in them (and what type/kind of bag to go with as well!). Since out of town guests are likely traveling a bit to come to your wedding and aren’t typically from the area, we love the idea of adding local treats to the welcome basket. A $5 gift certificate to a local ice cream shop, popcorn from a local small biz, coffee from a local coffee shop or anything that is specific and a staple in your town or city. If you are having destination wedding, selecting goods or treats that are famously local to the area is also a great option. For example: if you’re wedding is in the Florida Keys, including Key Lime cookies would be a delicious and appropriate treat to add to your bags. Ah, the classic. It’s likely your guests will be ready to party, but not ready for the piercing hangover the next day. 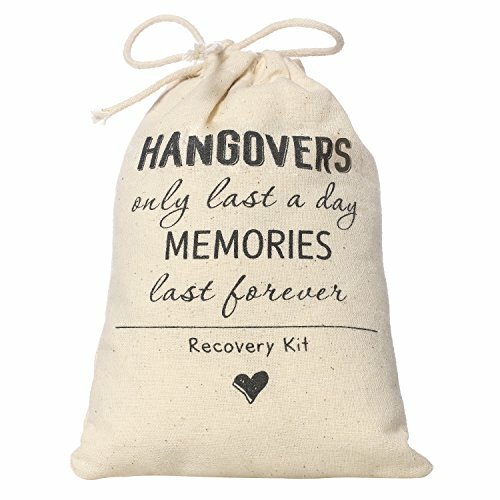 Everyone loves a good hangover kit filled with Advil, water, 5 Hour Energy, mints, pretzels, even Emergen-C is a great addition! An added plus: most of these items can be travel sized which means that your guests can carry them onto their flights. We LOVE the idea of adding a weekend itinerary - complete with any pre-wedding or welcome party, rehearsal dinner, wedding, and every event in between! This helps your guests stay organized and know what to expect all weekend. It’s also a great idea to add a map of the area, or even local recommendations of things to do, restaurants, and so on. You could even do a “his” and “her” recommendation list with all of you recs in the area! There’s not many people that would deny free booze, so we love the idea of adding a mini champagne bottle for your guests to pop as soon as they arrive to the hotel. Add in some cute straws, and you’re set! Another option is mini alcohol bottles (or alcohol nips) in your favorite alcohol of choice. You can usually find these sold by the box making for an inexpensive addition to your welcome bags. So now let’s talk the actual “welcome bag” itself! What do you put all of the above goodies in? Here are a few ideas that we LOVE! Depending on the wedding - destination, beach, local, small hometown, big city, etc. changes which type of bag you should use! Keep reading to find out which kind of bag you should choose for your welcome bags! If this is your thing, it’s a great way to up the simple brown bag game. Either purhcase these on Etsy, or make your own! Here is an Etsy shop that does these bags well. We love this custom destination market style tote bag. It can be used as a beach bag for guests, and can be used again and again! A custom label is perfect to accompany your perfectly ~branded~ wedding! Customize with your wedding logo and you’re set. This is also a budget friendly way to take an inexpensive brown bag up a notch!